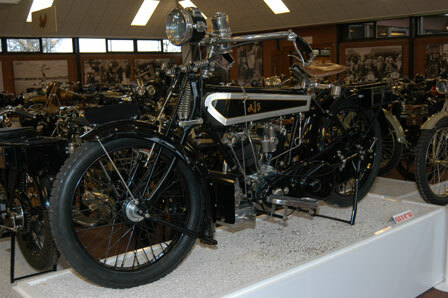 With an original capacity of 698cc, the model D first appeared at the 1912 Motor Cycle Show, thus beginning the long line of AJS big twins which ended with the 1000cc machine of the late 1930s. It was quite an advamced machine for its time, being equipped with all-chain drive and a three speed countershaft gearbox. The first engines had detachable cylinder heads but following customer complaints of joint leakage, integral heads were introduced on the 1913 machines. By 1915 the capacity had been increased to 748cc and externally the appearance was altered by the use of a dropped top tube frame and the raher attractive tapered fuel tank. In 1916, detachable cylinder heads were again in use but in the early part of the year motor cycle production ceased. The firm having missed out on motor cycle contracts for the Services the factory had to change over to munitions and the big twin went into cold storage for the duration, reappearing at the 1919 show. Engine - 74 x 87mm = 748cc side valve V-Twin. Total loss lubrication by hand pump. Splitdorf Magneto ignition. Amac automatic carburettor. Cast aluminium silencer. Transmission - All chain drive via AJS three-speed countershaft gearbox.